Bath times with your kids is that weird mixture of fun and misery. It’s so cute to watch your kid playing with his bath, it’s one of those images that you will cherish long after they have left the roost and make lives for themselves. It’s also a great bonding moment between a child and his parent. But picture perfect bath times are, in reality, quite rare. The more common scenario is your kid screaming his head off, or whining about baths, or doing both at the same time – yes, they can whine and cry at once if they want to. To make baths more fun for your kid and lessen all the troubles you can get the iDuck. The iDuck is a high tech rubber duck – that perennial bath time favorite. What sets this space age ducky apart from the usual rubber ones is that it’s actually an electronic gadget. 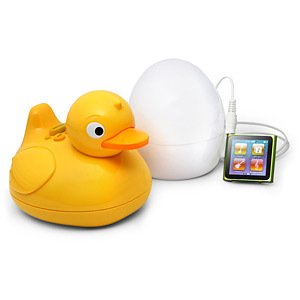 Hidden inside the duck is an MP3 player that will allow you to play your child’s favorite songs while he’s in the bath. The iDuck can then be used just like your regular rubber duck without fear of it getting damaged by being drenched in water or electrocuting your child. The music is not stored inside the iDuck but it is actually transmitted to it. Aside from the duck toy, the iDuck also comes with an egg transmitter. Just plug in your iPod or any media player to the egg transmitter and it will transmit the signals directly to the duck toy. It’s seamless, trouble free and quite easy to use. Your kids can rough it up with the duck toy. It’s built to withstand the attention of children so you can scrub away while your kids are distracted. And who said the iDuck is only for kids? You can use it as well when you take your bath, and transport yourself to that time when you were the one whining and crying.